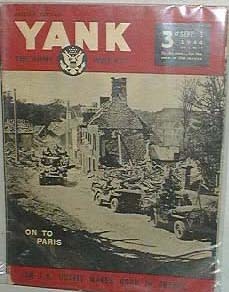 Yank the army weekly, British edition, Sept. 3, 1944, Vol.3 No. 12.,3d cost., cover story an f.a. outfit makes good in france., cover picture is on to paris, army tanks and jeeps moving on to paris., small tear in left corner near binding,tear on back page., wear on edges otherwise good condition. Items Similar To "Yank Army Weekly, British ed., Sept 3, 1944"